Piggyback Poutinerie has been open in Lethbridge just since April 2014. The owner Dylan, has been in the food industry for several years, and started his career out at the Keg. When he realized that their was a niche in the market in Lethbridge, he and his wife decided to open a poutinerie. As much as is possible, Dylan tries to buy local ingredients. But there are just some things that you can’t get in Alberta; Lobster for example. Which was a special poutine a little while back. All of the potatoes are pre-blanched, which work better for preparing, as frozen potatoes don’t work because there is too much water on them. In the first 6 weeks that they were open, Piggyback Poutinerie sold over 7,500 lbs of potatoes!! One of the favourites on the menu is the Triple Porky : BBQ Pulled Pork, Bacon, Maple Sausage, Cheese Curds and Brown Gravy! This was my favourite!! Another one that I tried when I was there was the Daisy: Duck Confit, Bacon, Cheese Curds & Brown Gravy. There are often specials that Dylan comes up with. On the day that I got to help cook it was Chicken Parmesan Poutine, lots of people ordered that one! There are also vegetarian options available. Piggyback Poutinerie uses a cheese blend of Quebec Curds and Mozzarella for that pulley stringy texture. So delicious!! So Aberta foodie friends! 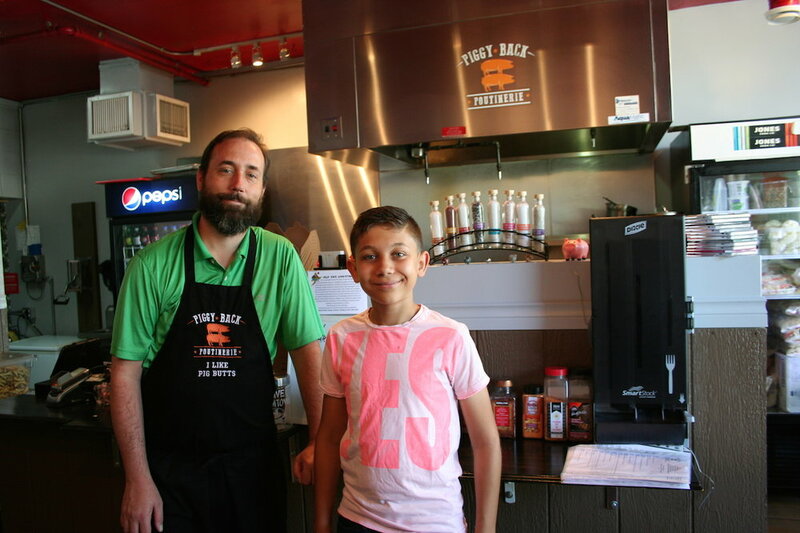 Take a drive to Lethbridge and go visit Dyaln at Piggyback Poutinerie. 315 6th Street South.